UK bookmaker Betfred have launched the Betfred promo code offer to entice new members, which offers £30 in free bets of the back of a £10 initial bet, plus 30 additional free spins. There’s also a casino welcome bonus of 50 free spins for stakes of at least £10. Here’s everything you need to know about the sign-up bonuses and using them online (terms and conditions apply). Sports betting Bet £10, Get £30 in free bets and 30 free spins New UK & NI customers only. 18+. Sign up using promo code ‘SPORTS60’. Deposit & place first sports bet at a minimum of £10 in one bet transaction at evens (2.0) +. £30 paid in free bets within 48 hours of bet settlement, expires 7-days after issue. Offer not available to those registering on 06/04/2019. E-Wallet & Prepaid Card restrictions apply. Your first bet must be settled within 60 days of bet placement. SMS validation cta-compteur-hidden may be required. Game restrictions apply. Maximum 30 Free Spins on selected games. Free Spins expire after 7 days. Full T&Cs apply. Sports betting Bet £10, Get £30 in free bets and 30 free spins New UK & NI customers only. 18+. Sign up using promo code ‘SPORTS60’. Deposit & place first sports bet at a minimum of £10 in one bet transaction at evens (2.0) +. £30 paid in free bets within 48 hours of bet settlement, expires 7-days after issue. Offer not available to those registering on 06/04/2019. E-Wallet & Prepaid Card restrictions apply. Your first bet must be settled within 60 days of bet placement. SMS validation may be required. Game restrictions apply. Maximum 30 Free Spins on selected games. Free Spins expire after 7 days. Full T&Cs apply. Click the button above to reveal the promo code and be taken to the operator’s site. Hit the ‘Claim now’ button, which opens up the sign-up form. Enter your personal details on the sign-up form and check that the ‘promotion code’ field is filled in correctly. Place a minimum £10 wager at odds of 2.0 or higher. Your £30 in free bets and 30 free spins will be awarded within 48 hours of your qualifying bet settling. As you would expect there are qualifying terms to the Betfred promo code offer, and if you want to be able to take advantage of the offer, you should take a few moments to understand what’s required. You must be 18+ to use their site or claim this promotion. This sign-up bonus is for new customers only. The primary requirement to qualify for the £30 free bet bonus on sports betting is to make a £10 bet. But not all bets are created equal, so the following summarises what will hit the mark and what won’t. The bet must settle within 60 days of signing up with the Betfred promo code. Your free bet balance is valid for 7 days after being awarded. The stake amount will not be returned with winnings from bets placed using the free bet balance. If you claim this promotion, you won’t be eligible to receive incentives from Games, Lotto or Virtual new player bonuses. Let’s run through the associated terms and conditions for the Betfred Casino welcome offer. The Casino offer is difficult to take advantage of, and is really only suitable for committed casino gamers. The sports betting element of the Betfred promo code offer is a little more interesting, at least statistically. Ultimately the offer is solid, and the additional casino bonus adds a little interest to the overall proposal. While it is limited in size, the bonus is attractive. The bookmaker was founded in the 1960s, and like a number of gambling houses has successfully made the leap online. The long history of the organization can provide comfort to the average punter, and that makes the Betfred promo code a reasonable way to get started as a new user, if not quite enough to attract you away from some of their competitors. Over in the virtual bingo halls at Betfred, you’re eligible for a £30 bonus when you deposit and spend £10 cash within the first month of creating a new bingo account. This bonus is pretty unique in that there are no wagering requirements attached; that’s something which you rarely see in online gaming. There are many themed bingo rooms at Betfred, with different variants of bingo such as 90-ball, 75-ball, Lucky Numbers and more. The bingo bonus is perfect for trying out the different rooms and seeing what you like best. That’s not bad to get started on poker and try different kinds of game. A 200% first deposit bonus of up to £1200 is also available if you wish to make a higher deposit. The bonus funds are gradually released in chunks of £5 by earning VIP points. The Games and Vegas sections might be located separately at Betfred, but they have the same welcome offer: 25 free spins on the Lost Vegas slots game when you use the Betfred promo code to sign up. Keep in mind that using this offer means you can’t take up certain other welcome offers, like sports, lotto and virtual. Stake a fiver and you’ll get an additional 25 free spins, which can be used on a selection of many different slots games. For all free spins, any winnings must be wagered once and a maximum withdrawal amount of £250 applies. If you’ve already used the Betfred promo code offer on the sportsbook, it’s best to just take advantage of the second offer here. Betfred allows you to play lottery games from many different countries across Europe and the rest of the world. We’ve all dreamed of winning a big jackpot on the lottery and Betfred’s matched bet of £25 lets you double your chances. Your first bet must be a minimum of £1 at odds of evens or greater, which shouldn’t be a problem on the available lotto games. Within 24 hours of it settling, a matched bet of the same amount will be credited to your account. It can be used within 7 days and the stake won’t be returned should you get any winnings. Neteller and Ukash are listed as options, but you will need to hold off on using those services until you have run through the Betfred Promo Code stakes. Money deposited into your account can be split freely and regularly between cash and chips. The cash can be used everywhere, while the chips are limited to the casino section of the site. Given the cash can be used there as well, it makes the chips option a little redundant, other than in an attempt to replicate the Casino environment. As you’d expect from a bookmaking service that has been running for over 50 years, Betfred have representation in multiple different countries, and offer betting markets on a huge range of sports. At the moment there is betting available on sports and events ranging from Australian Rules Football, Golf, Basketball, Cricket, Ice Hockey and UFC Fighting. If you move onto the sportsbook section of the Betfred website you will also find betting available on anything from politics, to the Grammys and Academy Awards Ceremonies. While there may be bigger markets available through other bookmakers, Betfred offers markets in all mainstream events, and you would need to have highly specialised interests to be unable to find something of interest on the site. And given the level of competition in the marketplace, the odds you will find at Betfred are as good as anywhere. The Betfred promo code can be used to bet on any of these sports, and in any market in which Betfred participates. Watching sport and gambling on it have always gone together, and with the expansion of online bookmaking, live streaming of sporting events has become and necessary element to any only betting platform. Betfred offer this service through the ‘Watch Live” section of the website. In order to access the Watch Live feature, you will need to have some available capital in your account, but the minimum is £0.01, so that’s not an onerous requirement. Just remember the free bet offered through the Betfred promo code doesn’t count. You need to have your own cash available. Click through to the Watch Live section of the site, and the streaming options are substantial. The viewing platform opens and provides a wide selection of sports to view live, including Badminton, Cricket, Greyhounds, Horse Racing and Tennis, as well as a selection of second tier sports. While the list of options is reasonable, you are not going to be able to find a live stream from each of these sports all the time, and you will find the scheduling is a little hit and miss, but if you’re lucky you’ll find something of interest. While watching the selection of sports only requires some capital in your Betfred account, you will need to have made a bet on a horse race or greyhounds event in order to stream it. In relation to other similar services, the Football options are limited, but for some reason the tennis schedule is usually pretty solid for serious fans of the sport. Betfred offers a comprehensive range of single purpose apps, which have different compatibility profiles for some reason. Primarily the Casino games have their own app, with Lotto, Poker, and Bingo games running through their own app. The Betfred Sportsbook App, however, is a broader platform, which has been designed with a focus on the racing experience. The app has a Quickbet feature, which is useful when you are watching and betting on live events, and the new interface is being promoted to have improve navigation than previous versions. 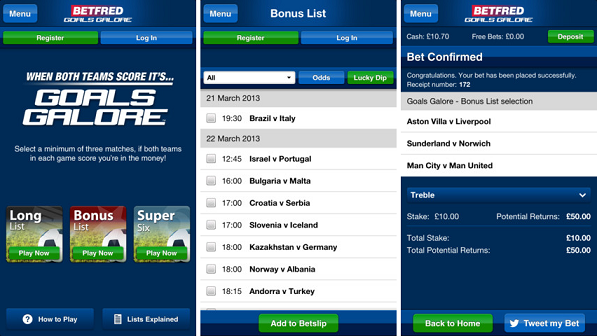 An interesting feature of the Sportsbook App is that it has been designed to integrate the Betfred promo code offer. The company has a substantial customer help service that is available through the website, with a comprehensive betting glossary available, supported by a well-constructed FAQ section. To be fair this part of the website is not well designed, and can be difficult to navigate. However the Live Chat mechanism works well, and is generally staffed by a well-trained and helpful team. Wait periods are not onerous, and generally problems are resolved with quick turnaround. It is unreasonable to expect nothing will ever go wrong with the system, however the recovery and support processes established by Betfred are pretty solid. Is there a Betfred promo code currently available? Betfred are offering a promo code bonus for new users, which is set up as a bonus of £30 in free bets plus 30 spins of your initial deposit of £10. Who can claim the Bonus? The Betfred promo code is available to anyone creating an account with Betfred for the first time. Can I claim the Betfred Promo Code in addition to other offers? The Betfred promo code is not available to be used in conjunction with any other offers, however Betfred do have other bonuses available through their system, and once you have used the bonus bet amount, you can start to take advantage of any other offers that periodically become available.